UPDATE: Rev. Otto Sotnak, previously associate pastor at Woodlawn Immanuel Lutheran Church, and who is mentioned briefly below, wrote to me after reading this post, and his thoughts provide further insight into the relationship between the Blackstone Rangers and Woodlawn community organizations. Rev. Sotnack gave me permission to reprint his letter, and I have done so in a new post. Intelligence tests indicated that Jeff Fort had an IQ between 48 and 58, a score indicating moderate mental retardation; however, Fort possessed exceptional leadership skill, organizational genius, and a magnetic personality. He misused these qualities to found and lead what was once Chicago’s largest street gang, the Blackstone Rangers, and to consolidate a gang cartel that endures to the present day. While building that empire during the 1960s, he lived here, at 1504 E. 66th Pl. (townhome on the right in the photo above), near the corner of Blackstone Ave. 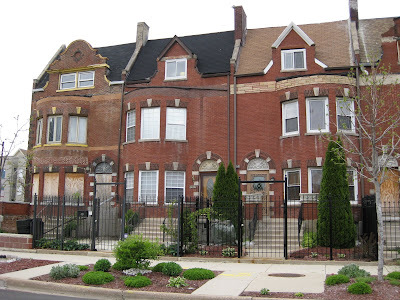 The neighborhood of Woodlawn was developed as a middle-class alternative to the higher-rent Kenwood and Hyde Park districts to the north. The World’s Fair of 1893, which took place in nearby Jackson Park, brought the demand to house thousands of workers associated with that event, and many of these remained after the Fair. Up through the 1940s, Woodlawn was a white, though not ethnic, neighborhood, but in the 1950s and 1960s, black residents from the Grand Crossing and Washington Park districts to the west began moving in. White flight to the suburbs, plus continued migration into Chicago by southern Blacks fleeing racial strife added to the flow, including Jeff Fort’s family, which arrived in Woodlawn from Mississippi in 1955. After the rioting following the assassination of Martin Luther King, Jr. in 1968, most of the remaining white residents moved out, with the exception of a few University of Chicago students and faculty huddled at the north end of Woodlawn between 60th and 62nd streets. The neighborhood remains almost entirely black to this day. (Personal story: in 1995, as a college freshman at the U of C, I attended an orientation session in which University Police presented us with a street map of the south side and told us never to go south of 60th street (or north of 47th); the primary effect of this talk was to generate great curiosity and frequent “forbidden” visits to Woodlawn). Jeff Fort was a troublemaker as a boy, and in the late 1950s, found himself in a juvenile detention camp at suburban St. Charles. There, he befriended a fellow Woodlawn delinquent, Eugene Hairston. Upon returning home, the two dropped out of school and founded the Blackstone Rangers, a street gang named after Blackstone Ave., which runs north-south through the heart of Woodlawn. Most street gangs are principally businesses -- businesses that offer extra-legal security services not provided by the police and a range of prohibited products, including narcotics, high-interest loans, prostitution services, and so on. These organizations operate in market niches created by unintended consequences of legislation; they are arbitrageurs of government policy. Like all businesses, however, their profitability is a function of competition, and a successful cartel can reap huge rewards. Cartels, however, are inherently unstable, as each conspiring business has an incentive to overproduce at the higher market prices created by the cartel, and the resultant glut of product causes prices to fall and breaks up the conspiracy. Thus, a cartel can only be maintained if the participants are able to closely monitor each other and punish those who chisel on the agreement. Efforts to do so are complicated by the fact that meetings of business managers for this purpose are prohibited by vigorously enforced federal and state antitrust laws. But for those businesses already ducking the law to provide illegal products and services, the additional cost of avoiding prosecution under the Sherman Act is low. Low IQ or not, Jeff Fort intuitively understood the tremendous profits to be made by cartelizing Chicago street gangs. Throughout his life, he showed a genius for subverting legitimate community and government institutions to reduce competition on the streets and consolidate power. He was also a master marketer and manipulator, using the noble image of the civil rights movement to deflect criticism and enforce his power in maintaining the cartel. Youth Officer Julius Frazier of the Grand Crossing police district is not as confident of the Rangers’ rehabilitation as Woods and the Rev. Mr. Sotnak. “Wait until nice weather comes again, and then we’ll see how good the boys are,” he said. The following year, in 1966, Fort convinced Woodlawn police superintendent Orlando W. Wilson to broker a very public “truce” between the Rangers and their longtime rivals, the Gangster Disciples. Wilson trumpeted his supposed achievement in the press, criticizing those who said he should be arresting these hoodlums, not engaging them, and these statements hamstrung Supt. Wilson in responding to the subsequent wave of violence unleashed by the Blackstone Rangers. Within 12 hours of the agreement, five rival gang members were shot. A month later, the president of the East Side Disciples, the local Gangster Disciples chapter, was dead on the street. The Rev. John R. Fry, pastor of the First Presbyterian church, 6400 Kimbark av., said yesterday that he is attempting to hold together the Blackstone Rangers, a teen-age gang, and that he is considering a court injunction to stop police efforts to break up the gang...."The Rangers is the only organization that offers safety from hostile forces at home, in school, and on the streets," he said. The gang has learned that violence solves nothing and is working for the betterment of the Woodlawn community, he said. In fact, the Blackstone Rangers were becoming increasingly violent. In September, 1966, gang members yelled “almighty Blackstone Rangers” before opening fire on a group of boy scouts leaving a meeting at the Essex Community Church at 74th and Blackstone. The following month, twenty Rangers invaded the lunchroom at South Shore High School during school hours, creating chaos by throwing furniture around and breaking glasses, dishes, and silverware, while assaulting twelve students there. During this time, Fort used his ability to subvert community organizations to consolidate a cartel of south side street gangs, forming the Black P. Stones in 1967. Obviously a play on the original Ranger name, the separation of “Black” and “Stone” in the name of the new group made the gang less location-specific and added racial and religious overtones. The “P.” variously indicates “People” or “Power,” depending on the context. The Stones were led by a council called the “Main 21,” chaired by Fort and Hairston, with representatives of different gangs working together to organize extortion, narcotics, and other rackets. In the civil rights movement and the country’s increased awareness of the slum conditions inhabited by many blacks, Fort saw an opportunity to milk government and charitable organizations for funds to support gang activities. Fort was not alone in this endeavor (on the west side, the Conservative Vice Lords were doing the same), but his audacious success brought him national fame. At the end of 1966, The Woodlawn Organization (“TWO”), a major community group, applied for a federal government grant amounting to over $950,000, in which the Blackstone Rangers would administer job training programs to young gang members in the community. It is difficult to imagine now how anyone could have thought that a known criminal organization would have the ability to run such a program and to avoid corruption, but government officials were as interested as anyone in appearing to be supportive of black community interests (not to mention buying black votes). The grant was accepted, and Fort personally oversaw the funds. Trainees (selected by the gang) received federal checks for $45 for every week they attended the Rangers’ programs. In fact, the Rangers demanded kickbacks of $10-$20 from each check, or sometimes just cashing the checks directly while forging attendance records. When training sessions did occur, participants learned little of value, but “played cards, rolled dice, or talked about women and sports,” according to one “student”. In one case, Fort held a dogfight during a government-supported job training session. So complete was the Stones’ control over the south side that the simple mention of the first name of their leader inhibited riotous mobs, and stores that purchased the placards survived intact. Other violence directly involving Jeff Fort includes an October, 1968 case in which Fort was arrested for assisting in the beating of a postal employee who had caught a 13-year old Stone initiate stealing a car and was holding him for the police. In July, 1969, Fort was again arrested for ordering the murder of Jackie Turner, a Navy midshipman returning from Vietnam, and an anti-gang organizer who had refused to join the Black P. Stones. Four Stones, wearing the gang’s trademark red berets, shouted “almighty Blackstone Rangers” before stepping out of a darkened gangway at 71st and Ridgeland and opening fire on Turner with machine guns. Amazingly, Turner survived. In late 1969, Fort again used the veneer of civil rights as a cause for gang enrichment. Operation Breadbasket, the Jesse Jackson-led wing of the Southern Christian leadership Conference, had waged a public boycott against the Red Rooster Supermarket chain for allegedly overcharging customers and serving low-quality products in black neighborhoods. Fort offered the company the opportunity to “hire” 22 gang members, including 15 of the Main 21, at inflated salaries, as a way to show solidarity and mend ties with the Woodlawn community. Fort personally was hired as an “outside store inspector”. The gang’s deal helped end the boycott, but their increasing demands finally bankrupted Red Rooster; Fort had killed the rooster that laid the golden eggs! In 1970, the P. Stones even allegedly extorted $160,000 from entertainer Sammy Davis (Sr.), who had an ownership interest in a Dixmoor-based liquor store, which he agreed to let gang members run. As some of the previous examples indicate, Jeff Fort was increasingly becoming a political figure, especially after he took complete control of the Black P. Stones when Eugene Hairston went to prison in 1968. Later revelations indicated that the Rangers had even weighed the possibility of high-profile assassinations during the 1968 Democratic Convention in Chicago, including those of incumbent Vice President Hubert Humphrey and Sen. Eugene McCarthy. But Jeff Fort’s most famous political statement came about not in Chicago, but in Washington that year. A January, 1968, investigation by the Tribune had revealed the extent to which the TWO grant was being misused by the Rangers. Fort was asked to testify before the U.S. Senate subcommittee on investigations to explain the apparent fraud. When asked his name, he replied, but after that refused to answer further queries. His attorney, sitting next to him at the hearing, demanded that Fort be allowed to cross-examine previous testifiers, who had claimed they witnessed fraud. Upon being reminded that a Senate subcommittee was not a trial court, Fort stood up and walked out on Congress, leaving his questioners shouting threats of contempt charges after him. In fact, Fort was later tried and convicted for contempt. The scene of the young black militant showing evident disrespect to the Senate made the front pages and headed the evening news. With his heightened political profile, Fort began to flex political muscle back in Chicago. In December, 1968, he led a march down the Midway Plaisance to State Street, demanding that the city rename State Street in honor of a slain fellow gang member, Jerome "Pony Soldier" Cogwell. After the march reached State, Fort led the crowd in smashing windows, jumping on cars, and generally rioting, until the police arrested him and scores of others. In fact, the scene was manufactured by Fort expressly for the intent of challenging Illinois laws against disorderly conduct. After his arrest, Fort sued Mayor Richard J. Daley claiming the statutes were vague and that city police used them to harass residents. The Illinois Supreme Court eventually ruled in favor of the validity of the laws. I've spent some time with some Panther friends on the West Side lately and I know what's been going on. The brothers that run the Panthers blame you for blocking their thing and there's supposed to be a hit out for you. I'm not a Panther, or a Ranger, just black. From what I see those Panthers are out for themselves, not black people. I think you ought to know what their [sic] up to, I know what I'd do if I was you. You might hear from me again. It is believed that the above may intensify the degree of animosity between the two groups and occasion Fort to take retaliatory actions which could disrupt the BPP [Black Panther Party] or lead to reprisals against its leadership. Williams, however, will have to wait for return of the trousers. Police said the slacks are evidence and will be needed during the court hearing. As a result, Ford was left pantsless. He telephoned his home and his mother brought another pair to the station. By August, 1970, Jeff Fort could afford his own pants. In that month, he was involved in a high-profile dispute with another community organization, the Kenwood-Oaklawn Community Organization (KOCO), the leader of which had recently testified before Congress about gang problems in Chicago. The Stones had unsuccessfully attempted to worm their way into a $3.5 government grant being dispensed by KOCO. One afternoon, Fort decided to call a press conference about the issue, to be held at his headquarters in First Presbyterian. Most of the city’s radio and print outlets sent a reporter within an hour of the announcement, but only one of the television stations did so. Luckily for Fort, NBC finally showed up, and the press conference went forward, as he complained about the leader of KOCO, who was black, "going to white men for help." While he had committed countless crimes over the past decade, September, 1970, saw the beginning of the end for Jeff Fort’s freedom. In that month, he ordered an all-out war on the police. In the instance that led to his arrest, Fort told a group of gang members to break out all of the lights along a certain elevated train platform, then to take up sniper positions against police there. That evening, an officer was wounded by a bullet shot from the position. He is in contact spiritually with each and every Stone. As a matter of fact, if you look around you from time to time you will get a glimpse of him. When the time is right each Stone who is truly Stone to the bone -- Stone to the spirit -- will be able to see "The Chief". During Fort’s time on the lam, detectives began trailing his girlfriend, Janis Connors. On October 30th, they saw her purchase a plane ticket for New York City. The detectives followed her onto the flight and, in New York, traced her to an east Manhattan hotel, where they arrested Jeff Fort and extradited him to Illinois. With him at the time of his arrest were papers indicating Fort was soon planning to flee with Connors to Algeria, where he would have joined Eldridge Cleaver and Timothy Leary. Fort had been arrested countless times before without being jailed. At the time of his extradition on the police sniping charge, he was under indictment or conviction for: two charges of attempted murder, three charges of aggravated battery, one charge of aggravated kidnapping, one of conspiracy, and one of concealing a fugitive. How had he managed to remain a free man during this time? Fort had excellent legal counsel, paid for at the expense of Charles Kettering II, grandson of the famed General Motors engineer and philanthropist. Kettering funded the Stones in the amount of $11,000 per month, which he openly admitted was intended for bail bonds and attorneys’ fees. Kettering, too, was entranced by Fort and the prospect of appearing sympathetic to minority interests. He also appears to have relished in the propinquity to dangerous criminals his money bought. He frequently referred to the Stones in public as “cats,” employing the slang of the era to signal just how hip he was. After his imprisonment, Kettering’s lawyers incredibly managed to eliminate most of Fort’s criminal charges. In the case of the attempted murder of anti-gang activist Jackie Turner, Fort was tried three times, and in each case, the judge declared a mistrial. In other cases, the state dropped the charges or found their evidence or their victim mysteriously missing. Between 1970 and 1972, Fort continued to actively lead the Black P. Stones, and it was common for 30-40 gang members to visit Fort daily at Cook County Jail. Finally, however, in May, 1972, Jeff Fort finally began serving a prison term for fraud in misdirecting funds at the TWO training center. He served four years, plus an additional year for contempt of congress, divided between state and federal prison. Jeff Fort was released from prison in the spring of 1976. During his imprisonment, he hatched an even grander scheme, to rebuild the Stones as a religious organization, which could hold cartel meetings in secret, protected by the First Amendment. The continuing story of that organization, the El Rukns, which Fort led into the 1980s, their consolidation of the drug trade in Chicago, and their audacious attempts at international terrorism, are detailed in this post and this one. The Black P. Stone Nation still exists as a major coordinating organization for Chicago-based street gangs, though it is better known today as the "People" (they are opposed by the “Folk”, those gangs associated with the Rangers’ primordial enemies, the Gangster Disciples). Local Stones chapters, while no longer held together in a rigid organizational hierarchy as they did when Fort was leading the gang, inhabit many south side neighborhoods, as well as many suburbs. Affiliate gangs are notable in several other states, as far away as Florida. The home at 1504 E. 66th Place, where Jeff Fort lived while building the Blackstone Rangers and the Black P. Stones, up until his arrest in 1970, suffered a major fire, suspicious for its timing, in November, 1970, within a few days of his arrest in New York. The building is still standing, and appears to be inhabited (though two of the neighboring townhomes show evidence of abandonment). It wouldn’t be surprising if the property were still controlled by the gang. Orlando Wilson was Chicago, not Woodlawn, police superintendant. Thanks for the article - very interesting. True. By "Woodlawn police superintendent," I meant "Chicago police superintendent working in Woodlawn". As far as I'm aware, Woodlawn never had its own police force separate from the Chicago police. Is the link broken to the post of the letter Rev. Sotnak sent? Thanks for the note. The link should be fixed now. this gang is so strange because they did thing other than kill and sell drugs. Very nice article!! Your contemporary photo is of Marquette east of Blackstone, not 66th Place. Yes, the post is a composite of contemporary newspaper accounts. I agree the newspapers sometimes get the story wrong, but they are the best available history I know of. If you're aware of other reliable sources, I would love to know about them. I moved into Woodlawn in 1955 at the age of 9 and grew up with the Blackstone Rangers. What the author apparently does not know is that the Blackstone Rangers are the 3rd attempt to make a go of having a street gang. The first one was named "The Players," the 2nd one was named "The Blackstone Raiders." And Blackstone ave. does not run through the "heart of Woodlawn". You all (Rangers/Stones) only HELPED the KKK kill off black people!! Since 1959 you all was a street gang. Jeff sister-in-law Penny led the Blackstone Rangerettes.Do anybody has Information on them? Where is Penny? Is she dead or alive? 1504 E. 66pl is presently a vacant lot. Almighty black p stone nation.get in tune, free chief Malik, free the prince wakeeta! Was Pee Wee her real names? When did Eugene Fort pass and how? Have anybody seem or talked to Bop, Droop, Herman, AD,Lil Bull and Killer Cain? The BGFs are influential to Racist Supremacist Group Gang known as the family. Racist Extremist Supremacist Group terror Gang Members known as the family known as "the family "commit violent crimes activities that include, Financial crimes that include bank fraud and murder, especially , mortgage fraud, to commit attempted murder, kidnapping, murdering street game members ,damaging and attempting to destroy the fraud victims Intellectual abilities, properties and interests, using sleep deprivation techniques and torture torturing the victims keeping them unaware to keep the victims from being aware of the Fraud crimes and schemes being committed against the victim to prevent the fraud crimes from testify. More than a 200 members of the family involved with crimes including racketeering conspiracy, RICO Conspiracies, murder conspiracy and attempted murder. In one scheme, the family — a Racial Biased Hate Motivated Organized Group Gang Members —conspiracy to participate in the affairs of a racketeering enterprise (RICO conspiracy), in violation of Title 18, United States Code, Section 1962. The family notorious for violent crimes to African Americans and other races that controls women and benefit from fraud crimes. The family and its associates engage in a variety of crime in order to maintain their presence in the criminal world, including murder, assault, kidnapping, extortion, bank fraud, Mortgage Fraud scheme scam and other violent crimes. The Family Racist Supremacist founded in 1960s in Shelby County Tenn was founded by Charles Kinchelow Sr. , Claude Smith II Athey Harper, Sylvia Campbell, Jessie Jones. This gang has become not only active in California but Tennessee Chicago as well. The Family members are very influential within the the justice system and are known to recruit correction facility staff to aid them in their Murders and attempted murders and illegal activities. This author probably thinks the chicago BPP was "gang". Booking Buddy is the #1 travel booking search engine, that you can use to compare travel deals from the large travel booking sites. I have searched for the unattributed newspaper article that you quote from after your first mention of Rev. John Fry, and can't find it. Would you shed some light on where you found it?